The H-13 Sioux (or Bell 47) has been an iconic helicopter ever since its introduction in 1946, shortly after the Second World War. It has valiantly served with many air forces and corporations, saving many lives during it widespread service. 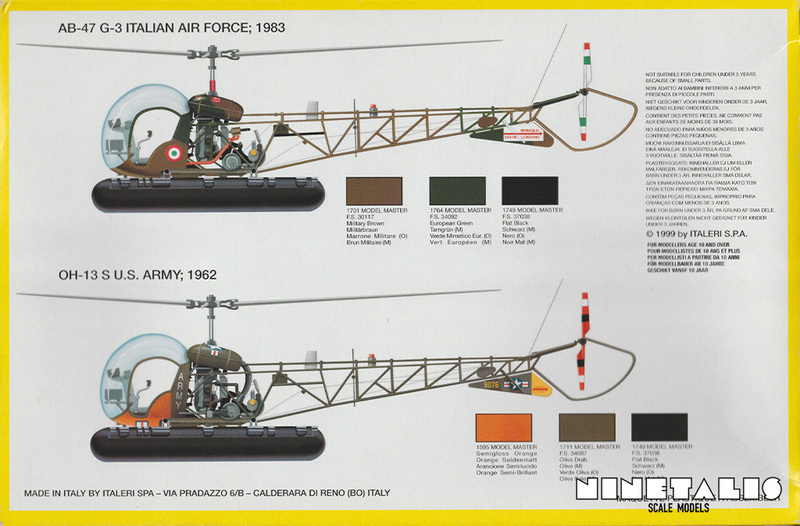 Originally intended as a light observation helicopter, it features a two bladed rotor powered by a single engine, which usually provided around 250 horsepower. The aircraft saw use during a number of conflicts, most notably the Korean and Vietnam War. Its main roles were transporting wounded troops or performing observation missions. As during the outset of the Korean war, there was no doctrine in place on the use of helicopters. However, nearly a year after the end of the conflict, the U.S. Air Force had transported over two million people by helicopter, in which the H-13 played a mayor role. Because of this It did not only prove its own effectiveness and usability, but that of rotorcraft as a whole. It went on to serve a long military life with the US Air Force, and was used by several other air forces and Coast Guards until very recently. Even in pop culture the aircraft has settled itself into the hearts and minds of fans from series like M*A*S*H, Whirlybirds and Skippy the Bush Kangaroo. This article is partially based on information found at wikipedia, 29th June 2015. Inside the kit we can find four bright red coloured frames, one clear frame, a decal sheet and an instruction sheet. The mean feature that distincts this kit from the previous boxing, is that this one features two floats which enabled the aircraft to land on the water. Regardless of the frames being mostly undamaged, one part has come loose. Despite my best efforts I have been unable to determine where the part came from exactly, so maybe it came loose from a part itself, instead of an attachment point, or maybe it is not even a part of the kit at all. Despite this one detail, the other parts are virtually undamaged, and the clear parts are in the best state possible. It should also be said that the parts are well detailed despite their age and feature both raised and recessed details. The only thing that hasn’t been able to stand the test of time well, is the decal sheet which has curled upwards on the sides of the sheet, but still seem to be useable. There are two large frames inside this kit. The first one featuring the landing skids, the seats, both the rotor blades, the landing wheels for the normal version and the left side of the tail section. 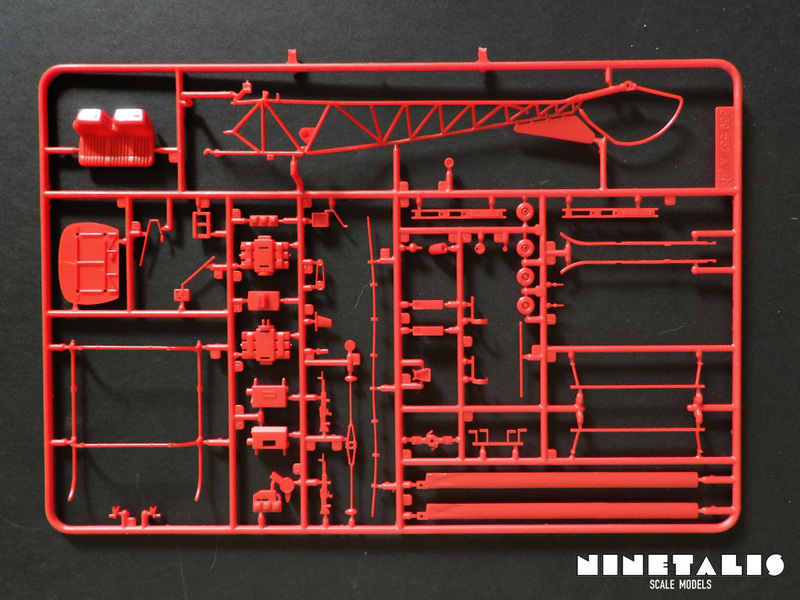 We can also find some guns on this sprue, which are most likely not needed when building the unarmed float version of this aircraft, as they were mostly used for civilian or coast guard duties. 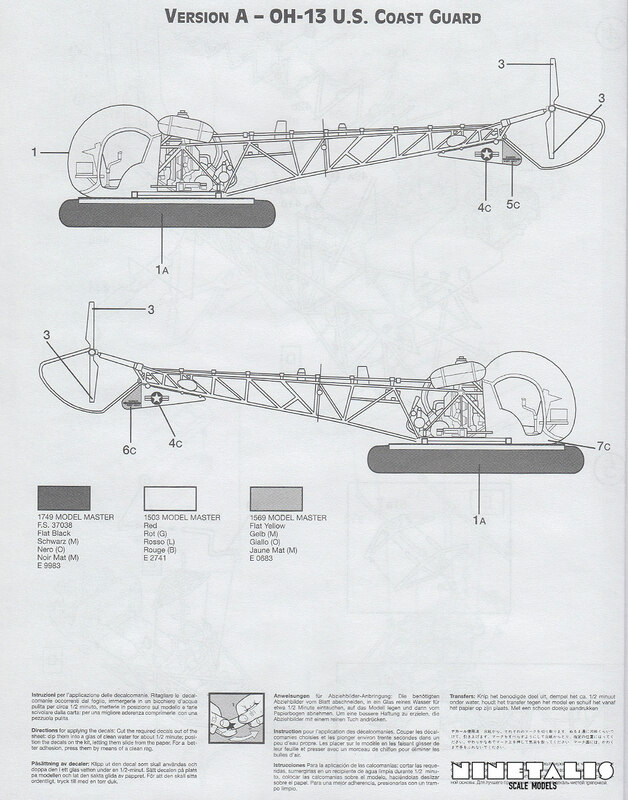 The second large frame within this kit features all the other parts for the aircraft, including the cockpit floor, instrument panel, fuel tanks, tail rotor, cockpit fuselage and the top and right side of the tail section, amongst other details. 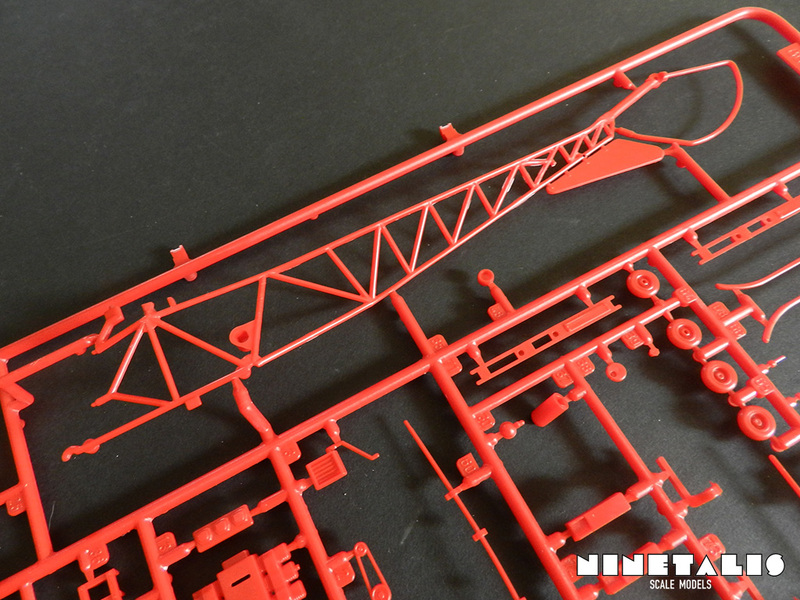 Like the previous sprue, these parts feature sharp details. 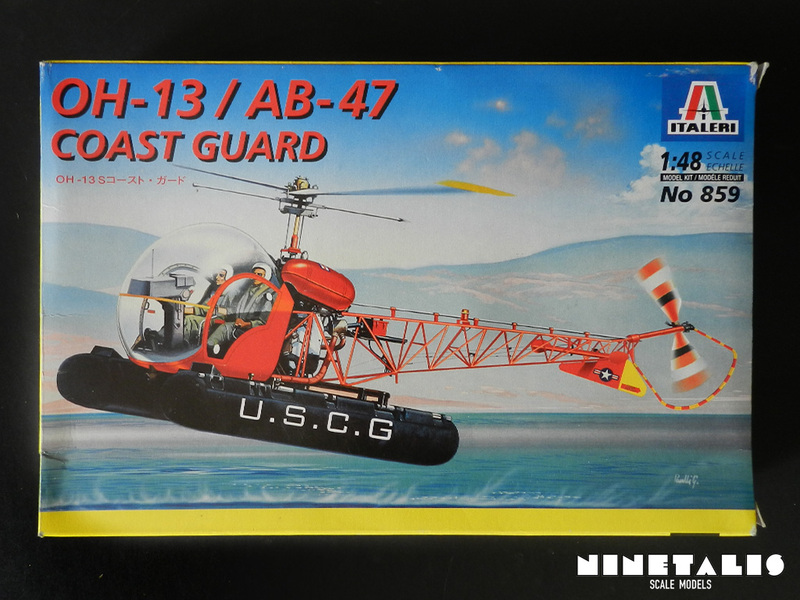 Think of the helicopter kits from Fujimi. If you like building those, then this kit will not disappoint. The last two frames basically contains the floats, which are split up in three parts. I’m not sure why Italeri has made a distinction between the two frames, because they really look the same judging by the parts and layout. Most likely this has been done for identification reasons. 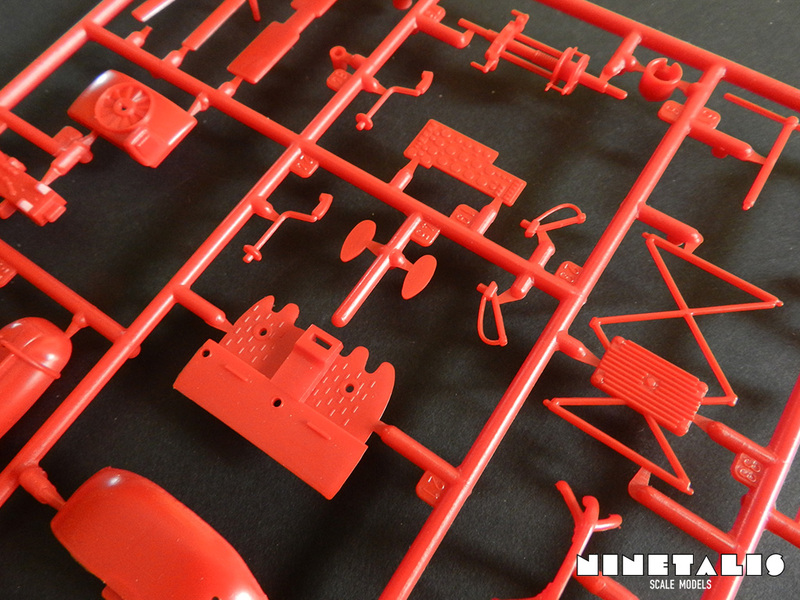 The clear parts with this kit are individually packed and are the most clean clear parts I have reviewed so far. I can’t find a single scratch on the parts and the reflection is phenomenal, as can be seen on the picture above. The challenge with this kit will be to keep them this way, as you will have to be very careful to put them in place without damaging them to much, which is difficult with a helicopter where practically half the fuselage (or more) is made out of glass. As mentioned before are the decals the only thing here that have suffered from the test of time, as the edges have curled upwards and the backing paper has lost a bit of its blue hue. Despite this, the decals still seem to be in a good and useable state. Silvering also seems to be at a minimum. 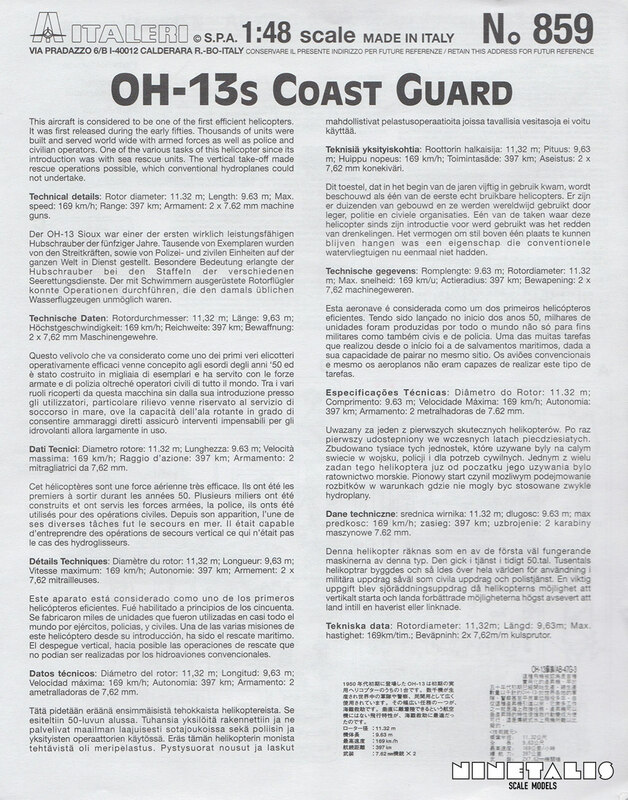 The manual containing the instructions is printed on a small leaflet, which folds into the size of an A5 sheet of paper. 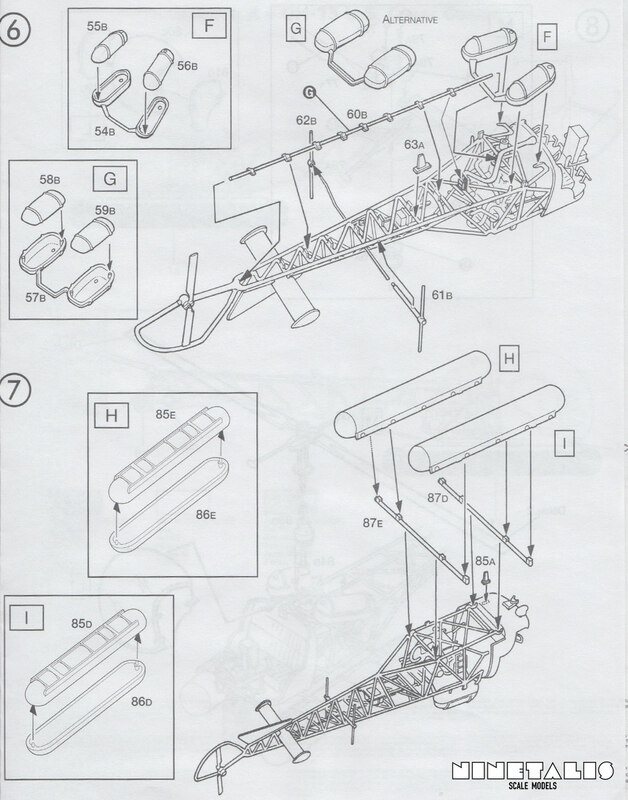 The build up of the kit has been divided into eights steps, containing various sub-assemblies. The illustrations seem to be quite readable, although you’ll need to search some painting steps yourself, like the colours of the engine. 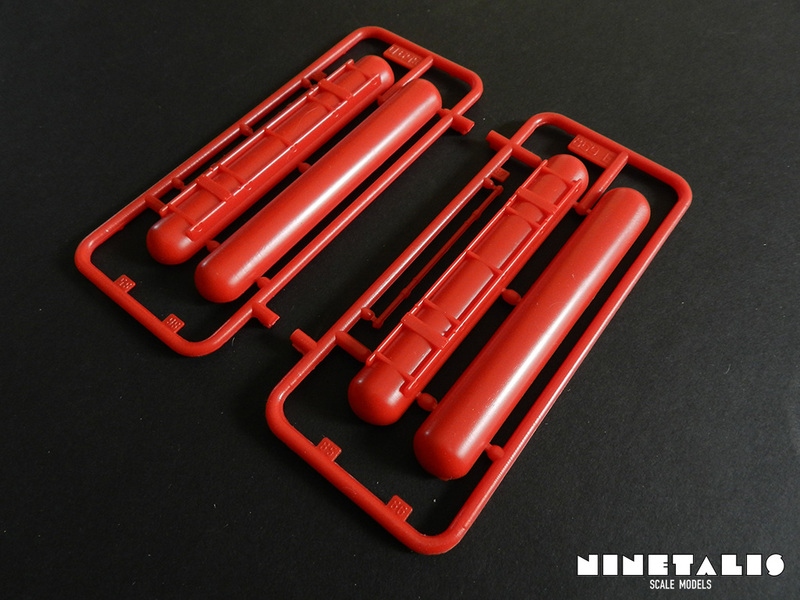 The instructions could have been a bit clearer, as an example, you get the option to build two different types of fuel tanks. However, as the aircraft included with this kit only use one single type of fuel tank, it is not explained which types used the other type. With the kit we get the choice of three markings. The first is the one we get on the cover of our kit, which a fully bright orange U.S. Coast Guard machine with white U.S.C.G. initials on the sides of the black floats. The second version is an U.S. Army from 1962, which is painted overall Olive drab with semigloss orange on the bottom of the fuselage. The final aircraft is an Italian Air Force, which is overall ‘military brown’ with ‘European green’ camouflage. All of these aircraft feature black floats, which seems to be something standard for these aircraft. This is a nice kit for a small helicopter. 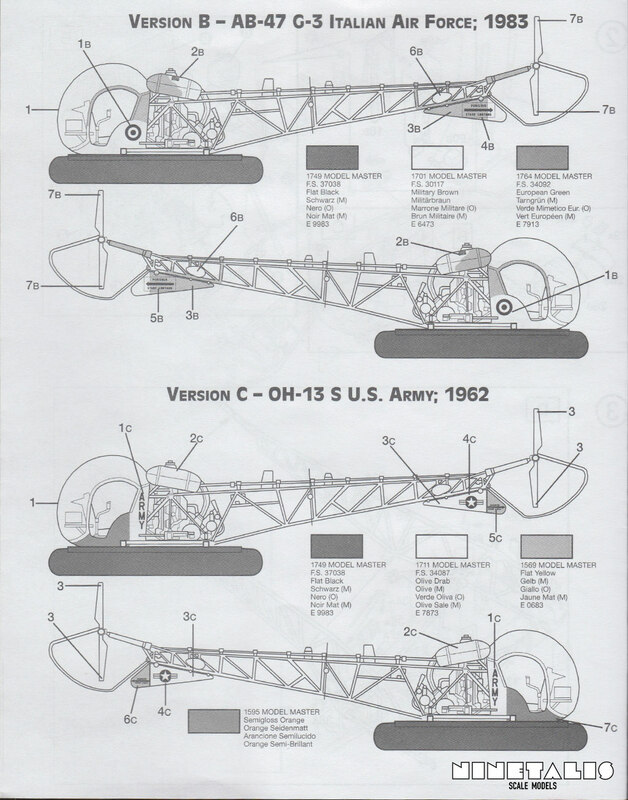 It still provides you with the parts needed for the regular Bell 47 aircraft, so if you don’t really want to build a floated version, you’re still well off with this kit. 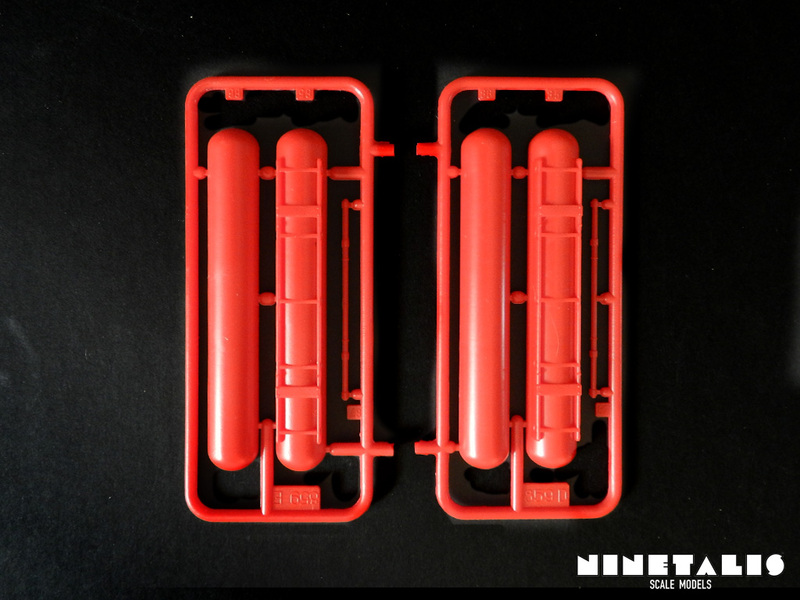 Why the sprues are molded in bright red is questionable, since there is no red with the provided markings. The parts are not detailed like they are with certain kits today, and although super detailers will want to improve it, it is definitely detailed enough for any regular modeller and will suffice for me. It really seems like a fun kit that you can do in a small amount of time and would look good on the shelf of military and civilian scale modellers the same. 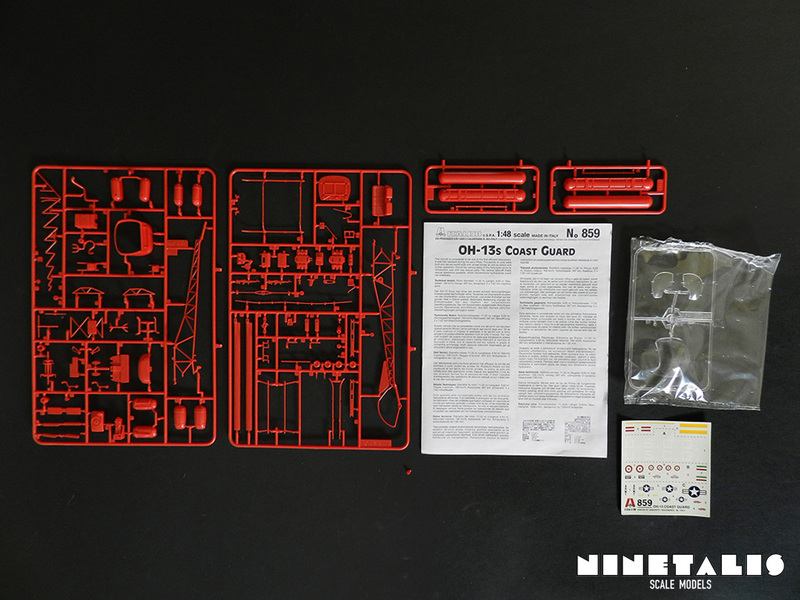 Due to the large clear parts I wouldn’t really recommend it as a first model, but I would recommend it to any other modeller thinking to tackle this kit.